Concerns are deepening that the planned implementation of reduced work hours unaccompanied by specific guidelines and supplementary measures will add to difficulties faced by local companies, pushing them further to move production abroad. Under the labor law revision passed by the National Assembly in February, the maximum workweek will be reduced from 68 hours to 52 hours in three stages, starting from July 1 at companies with 300 employees or more. 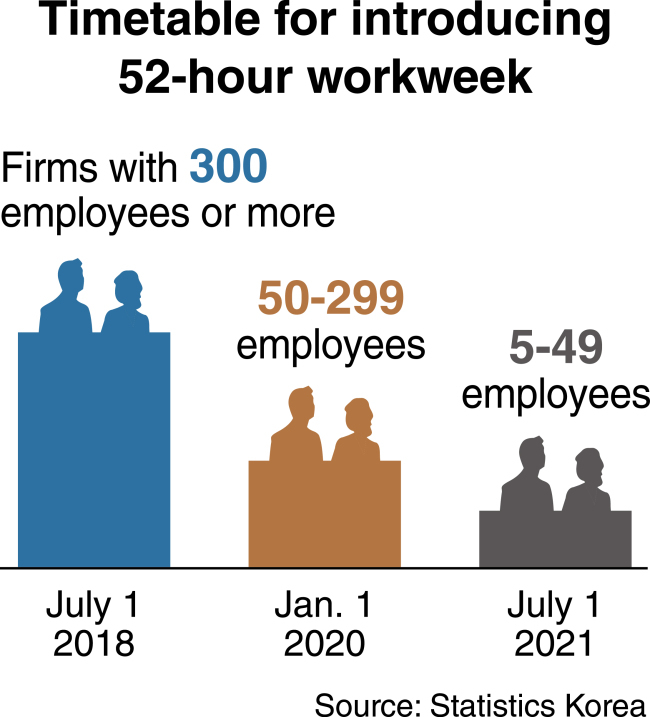 The shortened workweek will be applied to firms with 50-299 employees in January 2020 and those that hire 5-49 workers in July 2021.
Business circles have raised concerns that implementing a reduced workweek without considering different conditions of companies and industries will undermine corporate competitiveness. The lack of concrete standards for counting work hours has amplified confusion at work sites. “The country as a whole is becoming a test bed for the 52-hour workweek,” said a corporate executive, who asked not to be named. He expressed worries that repeated trial and error in the process would significantly hurt the global competitiveness of Korean companies. A reduction in work hours coupled with steep minimum wage increases is set to particularly weigh on small and medium-sized firms in the manufacturing sector, which are suffering from labor shortages and low productivity. According to a 2017 study by the Korea Economic Research Institute, a private think tank, cutting the maximum workweek to 52 hours -- 40 regular hours and 12 hours in overtime -- would incur 12 trillion won ($11.1 billion) in additional corporate costs, based on the assumption that they will not be able to cut the total pay packets of the existing workers. More than two-thirds of that was expected to be shouldered by companies with less than 300 employees. Labor officials say local firms need to increase their workforce by 10-30 percent to cope with the shortened workweek. 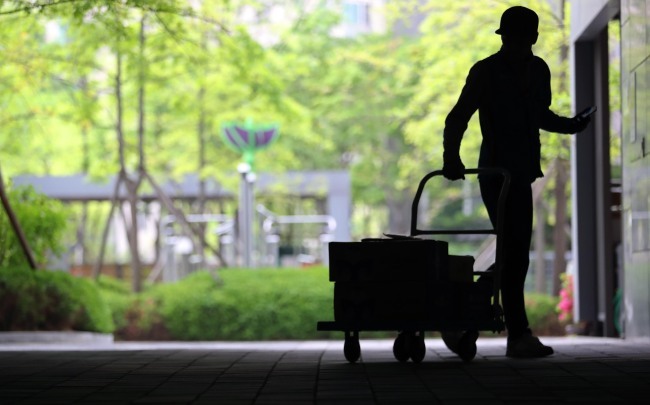 A study by the state-funded Korea Labor Institute last year predicted cutting work hours would create an additional 110,000 jobs as employers sought to fill in the vacated hours by hiring more workers. But many companies remain reluctant to increase employment as it is almost impossible to lay off employees under the current strict labor rules. President Moon Jae-in’s government has backpedaled on the task of enhancing employment flexibility. Last year, it ditched measures adopted by the previous administration in 2016 to make layoffs and changes to working conditions easier. Unionized workers have also objected to having their wages reduced by the introduction of shortened workweek, limiting the room for companies employing more workers. “Even if we are ready to accept additional labor costs, it will not be easy to find skilled workers,” said an official at a local engineering company, requesting anonymity. Experts call for expanding the flexible working-hours system to ease difficulties to be caused by the workweek reduction. “Companies should be allowed to organize work hours autonomously to fit their specific conditions,” said Park Ji-soon, a professor at Korea University School of Law. The Ministry of Employment and Labor has been criticized for dragging its feet on working out specific guidelines and supplementary measures to reduce confusion over the introduction of reduced work hours. Deliberations by ministry officials since the parliamentary passage of the labor act revision bill have focused on using more taxpayer money to help cover increased labor costs and compensate for reduced wages rather than making work hours more flexible. Experts also note that efforts to enhance compatibility between work and family life by cutting work hours need to be coupled with policies to improve the country’s labor productivity. In terms of labor productivity in 2015, the country ranked 28th among 35 member states of the Organization for Economic Cooperation and Development, according to a study by the Korea Productivity Center. The productivity gap between large and small firms was wider in Korea than in any other major economies. The KPC study found that small businesses’ productivity remained at 29.5 percent of large companies’ in the country in 2013, the lowest among 24 OECD members surveyed. The reduced workweek seems to be the last straw for many companies troubled with deteriorating business conditions at home in deciding to move factories abroad. Officials at the Korea Federation of Small and Medium-sized Enterprises say that the number of inquiries from firms that want to transfer production overseas has been increasing noticeably this year. The acceleration of corporate exodus is worrisome for the Korean economy that has seen facility investment drop and unemployment rise in recent months. Overseas direct investment by local firms jumped 11.8 percent from a year earlier to $43.7 billion in 2017, according to data from the Ministry of Strategy and Finance. This year is expected to see a steeper increase, as a growing number of companies find no reason to make additional facility investment at home amid rising labor costs and persistent regulatory rules. Experts say the government should pay more heed to improving the domestic business environment to keep more manufacturing firms from leaving the country.